It has been a long time since I have written a blog post, but today it is needed. 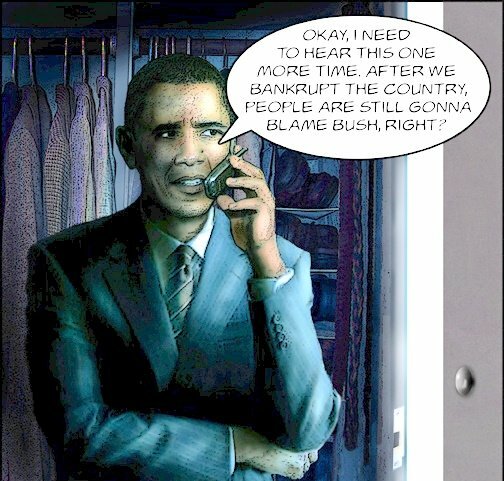 It seems everything that has happened in the past 18 months has been blamed on bush. The problem is, it is time for Obama and Congress to stand up and fix the mess they have caused. Millions of people are without unemployment as I write. This post is directed at the Republicans as well as the Dems. They seem to be able to pass health care, finacial reform and any other cause they please as long as it lines thier own pockets. Never giving on thought to those who need help. Some may agure that extending unemployment is not the answer, but without this small amount of help many will do without. It is not for lack of trying as jobs are almost non exsistant today. The only thing that is stopping the United States from returning to the unemployment rates of the depression is unemployment benifits. Yet, now the republicans, think the best thing to do is block this legislation. It is rare I agree with Obama, but today I do. All members of congress need to stop playing politics and think about the average unemployed american. They didn’t seem concerned about the cost of health care, when they shoved that legisaltion through. Now that we are getting closer to November, they are concerned about the cost. This tells me one thing, no matter the party, none can be trusted. I do not want to expand the government, but to deny millions unemployment when there are no jobs is completely and utterly heartless! It just goes to show that the only change we have seen is for the worse! For months before the election I warned that it would be a economic nightmare after the election. This has come to pass. Many say that the benifits have been extended enough! However, I am not sure everyone understands how this works. What it means is that many who have collected unemployment for a year and a half have no more benifits, that being said, I also want to piont out that many who have been unemployed for a few months also have no benifits! pass the bill! Many have been without help since May!!! I find it appalling that Hillary promised 500 million dollars to pakastan, when millions of americans have no job and no income. If the refuse to pass this, it will reflect on all incombants this fall. Obama and the dems have ruined our economy, bush had nothing to do with the massive unemployment rates we now see. To make matters worse, our only hope was the republican party. Now it looks as though they to have abandoned the ones who need it most. So, where does this leave all those who can find no job and have no income? I wish I had a answer for them, but I don’t. It seems there is no one in congress willing to help. Contact your congressman, ask them to pass the bill. I would love to know where all those congressmen are when we need them. The answer is simple they are to busy passing financial reform and regulating businesses so that they all are afraid to create jobs. Its all about power and control, and not about the people. This country was built on the people, for the people. But those values have been long forgotten, thrown in the pit of darkness, not to be seen. Thus is the status of our country, one that helps all other nations, but never its own. Every time a country needs help we respond, we even help bail out Greece, GM,Crysler and the banks. But the forgotten man is still very much forgotten. Why? the reason is simple, it does not line the pockets of congress. May the great spirit help us all, for he is the only one we can trust.